A bumper breeding season for pāteke has seen numbers of the rare native duck boosted in the Abel Tasman. 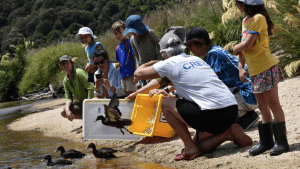 An opportunity to increase the pāteke, or brown teal, population in the national park saw 31 ducks released on the banks of the lower Awapoto River, at Hadfield Clearing, near Awaroa recently. 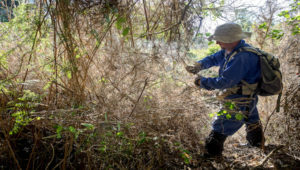 Department of Conservation senior biodiversity ranger Jim Livingstone said the national pāteke captive breed for release programme had better than expected breeding success this season and the pre-release conditioning facility at the Isaac Wildlife and Conservation Trust in Canterbury was nearing capacity. 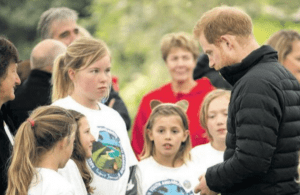 Abel Tasman Youth Ambassadors and students from Motupipi Primary School, Motueka High School and Golden Bay High School were on hand to release the birds. 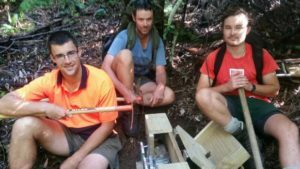 Project Janszoon and DOC have released 90 pāteke in the national park since 2017 and the birds are thriving with at least four sets of ducklings hatched in the wild. Project Janszoon ornithologist Ron Moorhouse said the Abel Tasman was one of only two breeding sites for pāteke in the South Island.